As I type R is at school and G is (not) napping. I feel loads better and am thanking the Lord that our trip down the H1N1/sick road was short. 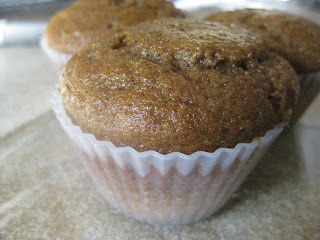 Yes, these delicious muffins use all the unripened tomatoes I recently harvested from our garden tomato plants. 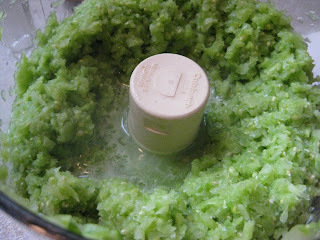 Measure out 2 cups worth of puree and add the other wet ingredients (applesauce through vanilla). Stir well. In a large bowl, mix the remaining ingredients. Stir well. Add the wet ingredients to the flour mixture and mix until just blended. Pour batter into muffin tins and bake for 20-25 minutes or until a toothpick inserted in the middle comes out clean. Finally a way to use all those green tomatoes without frying them (although fried green tomatoes are super tasty!). Green tomatoes? You are brilliant. These muffins look so moist and I will bet it's the tomatoes that do that. Oh yes, love me some FGT. But never thought to put them in a muffin. Awesome. Glad to hear you're getting better! That's a great idea putting GT in a muffin. I have some left in my garden that need to be picked.